"Swedish facing - well managed"
Withdrawing money can be done to a maximum of five thousand Euro (€5,000.00) per working day. Pooled jackpot wins are excluded from the daily withdrawal limit. Local jackpots are included in the daily withdrawal limit. Karl Casino Terms and conditions Apply. 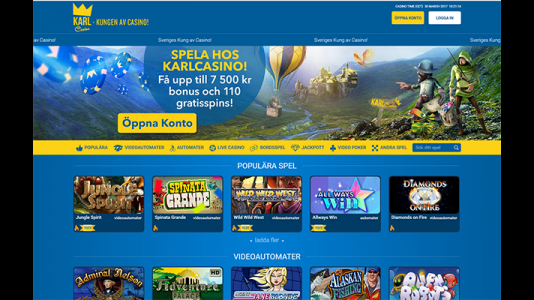 Pretty good casino – focused on the Swedish player. will be requested when required. They offer a system with: bet, loss, deposit and time limits. They offer a system to take a break from playing between one week to permanent. Sister site to Australia Casino, All Irish Casino, All British Casino etc. All in all a pretty good casino. They have not generated any complaints so far.